I tacked on a short visit to Rwanda following my Uganda trip. Whilst there I made a long anticipated visit to the Kigali Genocide Memorial Centre. A project of the City of Kigali the Centre’s content was conceived and developed by the UK based Aegis Trust who now have . It’s very hard to imagine what happened here. It’s physically very beautiful and appears very peaceful. That’s the banality of evil I suppose. Freddy Umutanguha who facilitated my visit to the Centre and answered my questions about Rwanda and the Aegis Trusts’ work there lost four of his sisters and both of his parents to the genocide. He spoke eloquently about his work and his belief in the healing and reconciliatory power or remembering. 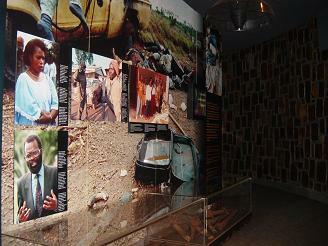 The display on the Rwandan genocide at the memorial centre is world class. Using photos, videos, including the testimonials of survivors, interpretive text in Kinyarwanda, French and English and occasional artefacts, all arranged in large panel displays, the exhibition takes visitors on a chronological journey of developments relating to the genocide. Although I’d read about the genocide in general and it’s genesis in Belgium’s colonial administration, the exhibition helped clarify and develop my understanding of Rwanda’s history and of how the genocide occurred. The exhibition panels effectively capture the madness and horror of the genocide in extremely effective and at times disarming ways. One panel (pictured) includes a small selection of guns and machetes that were used in the genocide. Three darkened rooms towards the end of the exhibition provide space for quiet reflection. 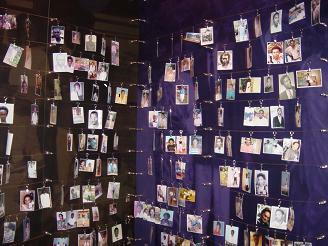 One is filled with photos, provided by survivors, of friends and family that were killed during the genocide. In another room, human remains and personal objects have been put on display and in the third and last room, a range of clothing items that were exhumed from mass graves across the country are on display. This visit is contributing to an article that I am writing which will seek to compare issues associated with the use and display of human remains in different memorial museums. Suffice to say at this stage that the display at the Kigali memorial centre was sensitively done and in my view a fitting testament to those that died. Apart from developing memorial centres and undertaking genocide education work the Aegis Trust are using satellite mapping and testimony to establish the location of mass graves throughout the country. People were killed on mass at road blocks so there are graves on the sides of roads across Rwanda. The demands of memory and of establishing the facts of what happened compete with the need to plan and build new infrastructure like roads so the mapping exercise is an attempt to have a record of significant sites that doesn’t stall these important developments. I will of course be writing about the memorial centre and of the Aegis Trusts work for publication and will post the published results to the website when they have appeared in print.